Graduate Commencement Ceremony – Friday, May 17, 2019 at 6:30 p.m.
Undergraduate Commencement Ceremony – Saturday, May 18, 2019 at 9 a.m.
Find out what we’re doing to capture your big day! 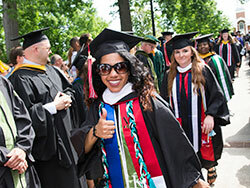 On Saturday, May 12, more than 730 students graduated at the 115th Commencement of University of Lynchburg. More than 100 studied abroad, and 68 of the undergraduates were student-athletes on varsity teams. Fifteen international students celebrated Commencement, including six from India, four from St. Lucia, two from Nigeria, and one each from Vietnam, China, and Senegal. The 2018 Commencement speaker was Setsuko Nakamura Thurlow ’55. Thurlow accepted the Nobel Peace Prize on behalf of the International Campaign to Abolish Nuclear Weapons (ICAN) in December 2017. Read more about Commencement 2018.